Hepatitis A: A nasty virus transmitted through the faecal-oral route, recommended for all travellers. Thyphoid (Buiktyfus): A bacterial infection by a Salmonella species using the same route. Yellow fever: Required for all travelers arriving from a yellow-fever-infected area. Not recommended otherwise. Difteria-Tetanus-Polio: Don’t forget to check if you have to get a new booster of this. Hepatitis B: Advised if you stay longer than 6 months. Because the virus is transmitted through the blood-body fluid route, the vaccination is advised to travellers with possible intimite contact with the locals. Rabies: Transmitted through animals like dogs, bats and other and causes brain inflammation. There is only 1 dog on Derawan, so I never get the rabies vaccination. No Malaria is reported on Islands of the Derawan Archipelago and inside the city of Samarinda & Balikpapan, the rest of the mainland of Kalimantan is infected. During the 5 years that I was on Derawan Island, 1 case of Dengue and no cases of Malaria were reported. 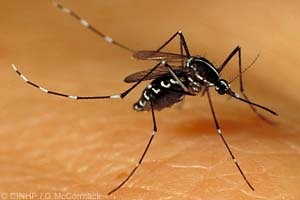 Mosquito’s: Type 1, recognisable by their black-and-white legs, stinging at daytime. These are transmiting Dengue fever. There is no vaccination available yet. The 2nd type of Mosquito (the females) are stinging after the sunset and could carry Malaria parasites. In Indonesia Malaria tropica is also present. You take anti-malaria pills OR you can deside to protect yourself properly and combine this by carring some emerency Malarone in case of infection (like I do). If you think your have Malaria you can fight this by taking 4 pills at once during a day for 3 days in a row, if you are in a remote area without a doctor. If you opt for the full protection (though not 100% protected): You can use Malarone if you’re staying up to 4 weeks the pills prevent the parasites reproduction in the liver and red bloodcells.